This article discusses Gibson (my grandfather) as poet in the family and poet of family, raising questions about the relationship between poetry and autobiography. It originates in a talk given to the Friends of the Dymock Poets, and was subsequently published in their journal: Dymock Poets and Friends 2012, No. 11, pp. 5-20. Download Wilfrid Gibson: poetry, family, history as a Word document. Copyright: This article is available for non commercial use with attribution, under Creative Commons Attribution-NonCommercial 4.0 International License. Other articles and information on Gibson and his family. Key People: Dymock Poets, Elizabeth Gibson, John Pattison Gibson, Michael Gibson, Wilfrid Gibson, Geraldine Townshend. Who was Wilfrid Gibson? Nowadays, many people would answer — ‘No idea!’ But he has never been completely forgotten, and when I started to look for an answer to this question, I found many versions of him. This paper will not discuss the different evaluations of his poetry. Instead, it will talk about him as poet in the family and poet of family, raise questions about biography, and in the process examine some of his less-known poems. ‘[M]y essential autobiography is told in my verse’, Wilfrid wrote to Walter de la Mare in 1934. 2 Years later there is a tantalizing suggestion that he had begun an autobiography, but no trace of it survives. Of his published poems, only a few are overtly autobiographical, and even those do not offer simple access to his life. Any biographer has to try and evaluate sources. There is a sort of hierarchy of credibility, with official documents like birth certificates at the top, ranging on down through contemporary diaries and letters, newspaper reports and interviews, to memoirs, reminiscences and the ever fallible family stories. But all of these are unreliable in their own way, and the evidence they produce is often contradictory. And how does poetry fit this schema? My own memories of my grandfather do not help much: I met him only a couple of times when I was a small child. He emerged briefly from his study to present me and my sister with a generous half-crown each — then went back in and shut the door. But my mother had his Collected Poems on her bookshelf, and (despite her discomfort with it) I tried to memorise the heavily sentimental A Garland for Jocelyn, about her life-threatening illness as a baby and her recovery to become ‘lively as a trout’. 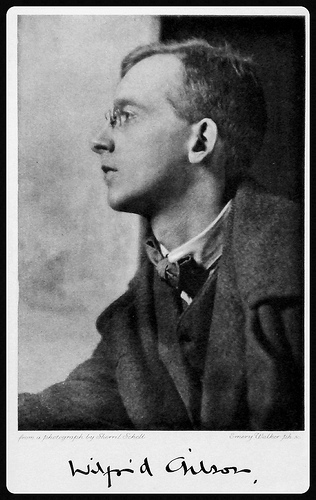 3 So for me he was a public figure — Wilfrid Wilson Gibson, Poet — but also someone whose poems gave an awkward, perhaps unreliable version of family history. Later, of course, I came to realize that none of the versions can be relied on. Factual mistakes are relatively easily dealt with — for instance the mythical Gibson, often reincarnated online, who was once a social worker, and fought at the Front in World War One. But he never fought, and — as far as I have been able to find out — was never any kind of social worker. Such errors, given weight by repetition, presumably derive from the misconception that poetry can only be autobiographical. More problematic are the conflicting accounts given by friends and family in letters, interviews, and reminiscences. For example, speaking of his character and personality, his friends describe a man of great charm, simplicity and integrity — while at least some of his family thought of him as a self-centred scrounger. His own version of himself evolves and changes: glimpsed in passing references in his letters; more fully elaborated in interviews; expressed, concealed or evaded in his poetry. Rather than try to provide my own definitive version from all of these, I will present some of the different voices and stories, hoping that the juxtapositions will suggest new possibilities and interpretations. For the first 34 years of his life, Wilfrid lived in the family home in Hexham, Northumberland. He was the baby of the family, the last of eight surviving children born to John Pattison Gibson and his wife Elizabeth. The family was comfortably off. His father was a successful chemist and businessman, a prizewinning photographer and a keen antiquarian and archaeologist who played a key role in the excavation of Hadrian’s Wall. He was also an amateur boxer and sportsman, and a Major in the Hexham Rifle Corps — a lot for a son to live up to. Fortunately for Wilfrid, his older brother John would take on the family business, so the pressure to follow in his father’s footsteps was perhaps less than it might have been. 4 For reasons that are unclear, he had less formal schooling than his older siblings, and by all accounts his sister Elizabeth, herself a poet, took on most of the responsibility for his education and encouraged his own writing. So what did he have to say about his family? He admired his father’s ‘proud and eager spirit’, and both shared a passion for the Northumberland countryside that would haunt Wilfrid’s imagination for the rest of his life. 7 ‘My mind inevitably turns North when I begin to write’. 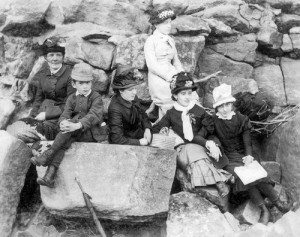 8 If his father brought Northumberland to life with his photographs and excavations, Wilfrid wanted to do the same with his poetry. Several of his poems show a desire to match or outstrip his father’s achievements through his own success as a poet, a theme that would recur in relation to his own son. His mother appears overtly only in one poem written late in his life, about her reading ‘Great Expectations’ to him as a child. 9 It is about his failure to live up to his own expectations; whether they were hers as well, is unclear. Her own grandfather John Adamson, had won a medal for his translations of the Portuguese poet Camoens, and she discussed poetry with Wilfrid and Elizabeth, making a ready audience for their own poems. Wilfrid stayed on good terms with most of his sisters, though as his letters tend to refer to a generic ‘sister’, it is often impossible to tell which one he means. His intense and mutually supportive relationship with Elizabeth was probably one of the most important of his life, but I can find no reference to it in any of his poems. 10 Initially, in early interviews, he acknowledges her support and influence; later he rarely mentions her. The picture Wilfrid did draw of his early life is fairly consistent: an uncongenial family, in a rough and ready part of the world, and a lack of sympathetic or likeminded friends. However, his talents were scarcely unrecognized in Hexham — his poems were published in local papers, and in 1901, when he was 23, one was inscribed on the town fountain. And he did receive encouragement from both parents. He was the only one of their children who never had to earn a wage. 12 His father provided him with an allowance, as well as subsidizing his and Elizabeth’s early publications. (Later, Elizabeth was given an allowance as well, after her health began to break down). Their siblings were perhaps less sympathetic — the tone of references to ‘poor Wilfrid and poor Elizabeth’ could indicate resentment as much as pity, as did the story that in later life Wilfrid would deliberately wear his shabbiest clothes when visiting relatives, hoping for a handout. 13 Wilfrid’s increasing public recognition was, it seems, met within the family with varying mixtures of pride, embarrassment and resentment. But although he struggled to survive on his father’s allowance, he refused all suggestions that he should earn a living in some more practical manner. And he never did. As his poems began to achieve wider recognition in the early years of the twentieth century, he expanded his horizons and friendships, envisaging a life where he and others practiced Art for Life’s sake. 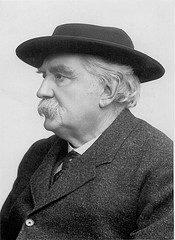 The years following his mother’s death in 1902 and his father’s re-marriage, were fraught with family crises. 18 Elizabeth married in 1911, and after his father died the following year there was nothing to keep Wilfrid in Hexham. His latest book Daily Bread was proving a success, and hoping to supplement this with his inheritance, he headed for London and the Poetry Bookshop, where he would begin a new phase of his life and meet his future wife. It is now that Wilfrid’s life becomes most closely interwoven with those later known as the Dymock Poets and their friends. Those friendships, important as they were, have been written about elsewhere, and here I will just touch on those aspects most relevant to my themes. Of London stairs we’d meet one winter’s morn? The end of wandering, the founding of his own home, ‘journey’s end’ — though there is a hint (perhaps unconscious) that marriage, for Gerald at least, would be something of a challenge. I have found no evidence that Wilfrid had any previous love affairs, though there are a few early poems that speak of love in routine clichés, and some letters to male friends which express very strong attachment. 25 There is no doubt of his love for Gerald, and his happiness when she agreed to marry him. She also had a small amount of family money; between them they could afford to rent a cottage in Dymock, where they would join Lascelles Abercrombie and others in a new venture — the poetry journal New Numbers. With the notable exception of Harold Monro — furious at losing his secretary, fearing a rival to his own Poetry Review, and perhaps also feeling some more unspoken jealousies — Wilfrid’s immediate circle welcomed his marriage. None of them really knew Gerald, though their assessments of her as potential housekeeper and muse are generally positive if patronizing. As for Wilfrid: ‘What an absolutely perfect husband he should make!’ wrote D.H. Lawrence. And Eddie Marsh concurred: ‘the Wilfrids … seem flawlessly happy’. 26 Well, you might think twice about taking marital advice from either of those two, but the omens seemed good as Wilfrid began a new phase of his life as husband and father, first in Dymock and then in Great Malvern. 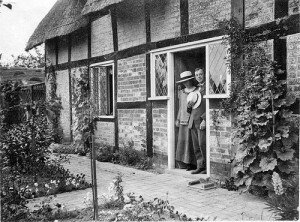 Wilfrid and Geraldine, the Old Nailshop, Dymock, 1914. Wandering voices of love in the hush of the night. 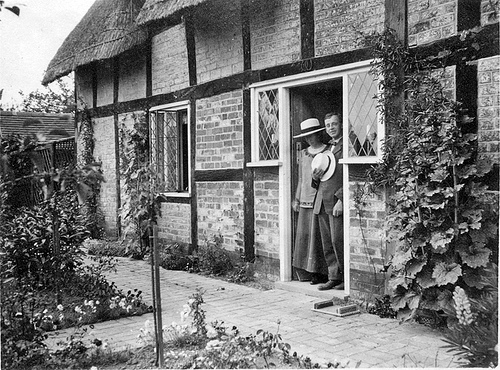 Such images of contentment are reinforced by letters written by Wilfrid and friends in the early years of their marriage, perhaps the foundation for Linda Hart’s description of the Gibsons’ ‘domestic bliss’ in Dymock, and the claim in the Dictionary of National Biography (now dropped from the online version after I asked the editors for evidence) that they had a happy marriage. 28 But how do they tie in with his children’s bitter memories of a marriage marred by their father’s selfishness? Or the evidence in his own letters and poems from the 1920s onward of his sense of failure not just as a poet, but as a husband and a father? The idyll has gone: life itself is empty of all delight. This is not just about the death of friends, the separations, destruction and desolation of war, but the death of a dream of happiness. The cottage in Dymock symbolises a place where friendship, family life, and poetry were once creatively entwined in a ‘Web of Life’ now ripped apart. Their first child, Audrey, was born in May 1916 and given the middle name Greenway, after her birthplace. Wilfrid wrote a number of tender poems to his daughter. This theme of father and baby is, I believe, unusual among war poems written by men at this time; a number of his later poems also deal with soldiers as parents of small children, thus undercutting the hypermasculinity of military life. Later that year the family moved to Great Malvern. The success of Georgian Poetry, and a legacy from Rupert Brooke, should have eased the Gibson’s chronic financial worries, though rampant inflation in these years must have added to their insecurity; the value of the pound more than halved between 1910 and 1920. Whatever the reason, by the end of 1916, Wilfrid decided to accept an invitation from his American publishers to tour the United States. Putting on, as he said, ‘a brazen face and brazen manner’ to cover his nerves, he set off, leaving Gerald and the new baby behind. 32 The trip was a great success from the poetry/publicity point of view, though he was homesick, and getting back again proved difficult, with Atlantic shipping increasingly vulnerable to attack. After returning, he finally managed to enlist at the end of 1917. Soon after, Gerald, alone with the baby, fell downstairs and was badly hurt, eventually losing an eye. Over the years the growing family would be beset by accidents and illness, with medical bills adding to their financial worries. 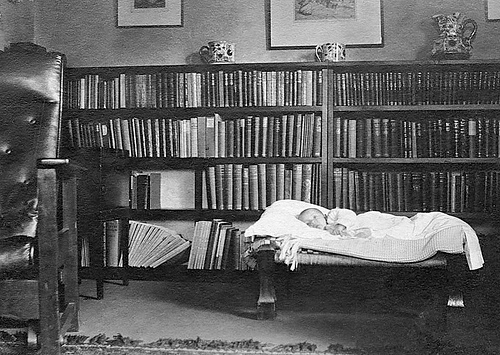 Wilfrid was still away in the army when his son Michael was born in 1918. Altogether he spent a year and a half as a private, mainly doing clerical work. Though never leaving the country, he did once narrowly miss being posted abroad — an occasion remembered in The Fatigue, his only war poem written explicitly in his own voice as a soldier, ‘Private Gibson, [number] 381907’, where he speculates about the man sent in his place, ‘playing my hazard with death’. 33 He was miserable in the army, hating the monotony and drudgery, missing his family and friends, and finding it almost impossible to write. Given his lifelong practical incompetence, his discharge was probably a relief to everyone. In 1920, the Gibsons’ third child Jocelyn was born in Great Malvern. As mentioned, she was seriously ill for some months, and although Wilfrid turned down Eddie Marsh’s offer of financial help he did ask him to be her godfather. Himself a non-believer, Wilfrid made sure that each of his children had at least one wealthy godparent: Marsh was also Audrey’s godfather, while Michael had Percy Withers, as well as Harriet Monroe and Lascelles Abercrombie for good measure. The idea was that however penurious the parents’ circumstances there would be someone who could help out the children, and Marsh and Withers did contribute generously to the Gibsons’ medical and school bills. The Gibsons next moved to the Pembrokeshire coast, where the children played on the beach most of the year round. After Dymock, this was their happiest time as a family, especially for the children. Gerald encouraged their interest in nature, and taught them about the world around them. And Wilfrid was at his best with small children: playing with them, swimming, telling them stories, sharing his love of the outdoors. This fed directly into his poetry. In the following poem he quotes directly from Michael. And crash them on the bonfire! Sings out the lad of seven. The note of loss here would intensify from this point on, as Wilfrid felt his physical and artistic energies dwindling. His reputation too was in decline. His income began to fall, and once again the question of whether and how to live by poetry alone came to the fore. 36 The problem, as Gerald and the children saw it, was that he had no other interests in life. And he was not prepared to do anything apart from giving poetry readings and lectures or — at a stretch — book reviewing, to supplement the family income. Nor did he help out at home. Gerald was responsible for everything: cooking, cleaning, making clothes (that shabby suit? ), gardening, clearing drains, doing the accounts and dealing with publishers’ contracts. When she was ill, it was her relatives, or later on the children, who were expected to help out. What Wilfrid did do, apart from his one domestic task of cleaning shoes (presumably a skill learned in the army) was write letters to his friends and patrons which move by degrees from discussing his writing to begging for reassurance to giving heavy-handed hints about his need for money. 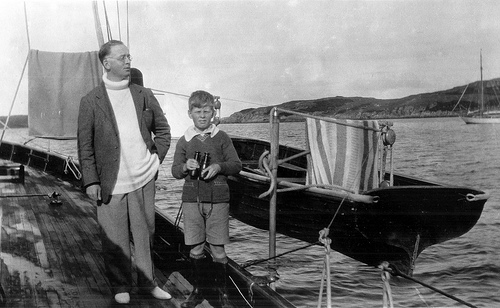 His wealthy patron Dorothy Una Ratcliffe sent cast-offs for Gerald to wear, and Gerald begged her to take Wilfrid on holiday on her yacht so that she could have a break. Eventually the family moved to a house in London big enough to take in paying guests — yet more drudgery for Gerald. Wilfrid’s beloved family was becoming increasingly alienated from him. In happier times they would tease the ‘Great Poet’, as they called him. Before you through the sky. In 1938, his children almost all grown up, Wilfrid published the ambivalent ‘Children’. The evidence of his letters to friends is that he was — sometimes at least — proud of them, especially Michael, who wrote the first of many boys’ adventure stories while still a schoolboy, and in the 1940s did the cover art for several of Wilfrid’s books. Behind the scenes, Wilfrid and Gerald made efforts to help each of the children as they set out on their own paths. But what Wilfrid communicated to the children was his bitterness and disappointment — with them and with himself. And though he wrote to others about the life of drudgery which was wearing Gerald out, and a number of his poems show a keen awareness of the harsh reality of domestic labour, at home that awareness was not translated into practical assistance or even acknowledgement. Maybe the dynamics of their relationship were such that Gerald’s independence reinforced his dependence: it is impossible to tell. Sadly, I have found only a few letters from Gerald, and her voice, her version, is largely absent. Then, in August 1939, catastrophe struck. A telegram arrived informing the Gibsons that Audrey, who was by then living in Italy with her German husband and their one year-old baby, had been swept into Lake Maggiore by a landslide. Her body was never recovered. Wilfrid and Gerald rushed out to collect Jocelyn, who had been there on a visit, and their grandson Roland, whose father was about to be conscripted into the German army. As the Second World War began, and their other children left home to embark on war work, the couple, now in their sixties, took on the care of their first grandchild. The family’s grief remained unspoken, unwritten about, by any of them — perhaps private tragedy was overwhelmed by the public catastrophe of the war; perhaps it was too painful. 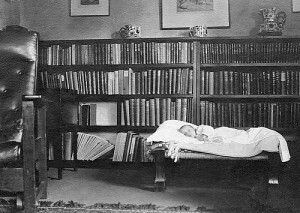 Yet despite everything, Wilfrid and Gerald found time to enjoy having a small child in the house again. As Roland grew older Wilfrid read to him and taught him about birds and wildflowers, while Gerald passed on family stories. Though Wilfrid began to write again, he would never regain his early success. His later poems are full of nostalgia for the Northumbria of his youth, and he often gives those early memories to characters in his poems. The happy days in Dymock seemed almost unimaginable now. For as long as I can remember, the ‘T’ key didn’t work … He had to go through all his typescripts filling in the ‘T’s’ by hand. I have not tried to cross the Ts and dot the Is in this paper. Sometimes gaps and spaces in the stories can tell us as much as an accumulation of detail might do. ‘My real self’ Wilfrid wrote ‘broods alone /And inarticulate, to all unknown’ — but, he says, that hidden self is found in some of his poems voiced through others. This article is dedicated to the late Helen Lowe, whose constant encouragement and sharp critical eye are irreplaceable. Thanks to Roy Palmer, Jeff Cooper and the Friends of the Dymock Poets for inviting me to write it. I am indebted to the family members who shared memories and stories with me: Penny Dedman, the late Michael Gibson, Pauline Gibson, Angela Harris, the late Jocelyn Hicks, Roland Huebsch, and Dorothy Talbot. Cockerell, Sydney, Diaries, British Library. — letters to and from Thomas Rooke, British Library. Gibson, Wilfrid, letters to Laurence Binyon, British Library. — letters to Sydney Cockerell, British Library. — letters to John Drinkwater, Marquette University, Milwaukee. — letters to Walter de la Mare, Bodleian Library, Oxford. — letters to Jack Haines, Dymock Poets Archive, University of Gloucestershire. — letters to Dorothy Una Ratcliffe, Brotherton Library, University of Leeds. — letters to Percy Withers, Somerville College, Oxford. — unpublished poems, Gibson collection, Brotherton Library, University of Leeds. Hogg, Roger, 1990, Wilfrid Wilson Gibson, People’s Poet: a critical and biographical study of W.W.Gibson 1878-1962, PhD thesis, University of Newcastle. Gibson, Wilfrid, 1926, Collected Poems 1905-1925, Macmillan, London. — 1920, Home, Beaumont Press, Westminster. — 1925, I heard a Sailor, Macmillan, London. — 1928, The Golden Room and other poems 1925-27, Macmillan, London. — 1930, Hazards, Macmillan, London. — 1938, Coming and Going, Oxford University Press, London. — 1945, Solway Ford and other poems, Faber, London. Hart, Linda, ‘Wilfrid Wilson Gibson (1878-1962)’ online article. Hassall, Christopher, 1959, Edward Marsh, Patron of the Arts, Longmans, London. Lawrence, D.H., 1982, The Letters of D.H. Lawrence 1901-30: Vol.2, ed. James T. Boulton, Cambridge, Cambridge University Press.